Low temperature combustion in homogeneous charge compression ignition (HCCI) engines is an alternative combustion technique to existing automotive spark ignition and diesel engines. The present study is aimed at fundamental understanding of phenomena affecting combustion and emissions of gasoline fuelled HCCI engines with internal gas re-circulation. The experiments that yielded the results were performed using dedicated engine test stand with single cylinder research engine. Different control parameter sweeps were accomplished to provide comprehensive data on engine operating parameters, combustion evolutions and emissions under variable conditions. Experimental analysis was also supported by engine cycle simulation to provide more comprehensive data on in-cylinder processes. One of the most critical components of an engine in particular, the connecting rod, has been analyzed. Being one of the most integral parts in an engine’s design, the connecting rod must be able to withstand tremendous loads and transmit a great deal of power. This study includes general properties about the connecting rod, research about forces upon crank angle with corresponding to its working dependencies in a structural mentality, study on the stress analysis upon to this forces gained from calculations and optimization with the data that gained from the analysis. In conclusion, the connecting rod can be designed and optimized under a given load range comprising tensile load corresponding to 360o crank angle at the maximum engine speed as one extreme load, and compressive load corresponding to the peak gas pressure as the other extreme load. A structural model is developed by means of Lagrange differential equat ons of second kind. Theodorsen model of thin oscillation airfoil with control surface is used for unsteady aerodynamic. Duhamel’s integral of Wagner function is carried out for transformation of unsteady aerodynamic to a time domain. The mathematical model is present in state space repres ntation. There is exemplification of the critical flutter velocity calculation and a dynamical response of the structure. The supplementary control surface for flutter suppression with simplified model is added. losed-loop feedback control system is formed and a several control laws are presents. The verification of open-loop model is done on behalf of the of the critical flutter speed comparison with FEM software for flutter analysis MSC. Nastran and flutter analysis program developed at CTU in Prague. The article also presents work on an experimental verification of the open-loop model in aerodynamic tunnel. Accident analysis plays an important part in the strategy to reduce road accidents. To significantly reduce traffic fatalities and serious injuries on public roads, there is need to review the characteristics of motor vehicle accidents and identify the hidden patterns behind the accidents. Identifying traffic accident concentration area is important for road safety improvements. Determining the risk rate in road traffic and its spatial distribution may indicate the areas that are more at risk in traffic in proportion to others. Beside, such analysis can identify differences in the nature of the problem among spatial units on the territory of a country. An analysis of spatial traffic risk distribution among the municipalities on the territory of the Montenegro has been conducted. The results of the study indicate that there is a significant difference in the amount of traffic risk among the municipalities. In the article on the basis of the developed mathematical model the dynamics of the highly nonlinear system is investigated, consistent patterns of resonant mode occurrences are established, which is experimentally confirmed. 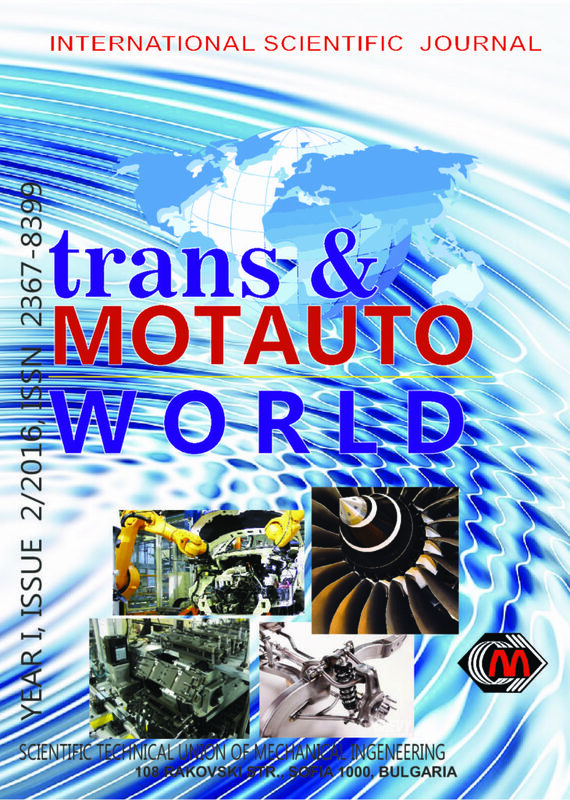 It is established that one of the main reasons for high dynamic loading and HMT elements durability reduction is subharmonic resonances caused by close agreement of frequencies of free nonlinear system fluctuations with multiple value of frequencies of diesel engine disturbances. On the basis of the new consistent patterns, the area of stability and parameter move direction is defined for its provision. The offered damper design is synthesized for significantly reducing HMT dynamic loading. Micro aerial vehicles design, due to their low Reynolds number aerodynamics, motivated the aerospace engineering community a lot the last year, and especially the flapping wing operated MAVs. The simulation of the mechanical equations of motion for a flapping wing MAV is presented in this work to have an approximate the behavior and the condition of flight of the vehicle and to present a control model that can be implemented to auto control the vehicle. The spherical coordinates system is used to develop the equations in this work , and Mathcad software is mainly used for the solution, simulation and graphing of the results, constants related to the size of the vehicle are changed to match different a range of existing flying insects or birds. Upstroke and down stroke of the flapping wing were modeled using two different drag coefficient. The study resulted in excluding the smaller sizes and higher flapping frequency from use of this model without any rectifications that account for the accentuated mow Reynolds unsteady effect, but bigger vehicles (bird sized) were modeled with a good accuracy and the model can be used as well for auto-control by predefined flying path.